For over a decade, Dr. Travis and his wife, Dr. Christel, have worked tirelessly to help dental patients from all over the greater Salem community and beyond enjoy happier, healthier smiles. Unlike a corporate dental office, his patients can look forward to dedicated attention, painstakingly personalized treatment plans, and a genuinely comfortable dental office atmosphere. With well over a decade of experience in the dental field so far, Dr. Travis has worked hard to hone his skills and greatly enjoys his job. He enjoys being able to blend art and science and also create a pleasantly comfortable atmosphere for patients that reduces their anxiety. 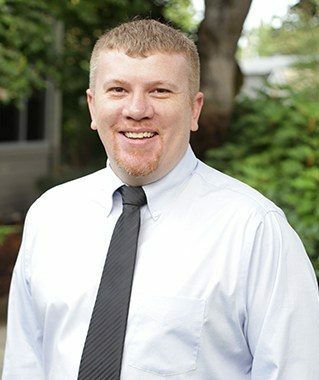 Dr. Travis originally hails from Oregon City. He and his wife have a cat named Carabelli and a dog named Pocket Jacks, or PJ for short. In his free time, he regularly volunteers with worthwhile causes like Medical Teams International, the local Neighborhood Dentist Program, and the Boys & Girls Club. He and Dr. Christel also regularly go on mission trips to Mexico to provide free essential care to underserved populations. As for his personal hobbies, he enjoys fishing (particularly salmon, trout, sturgeon, and bottom fish) and woodworking – he likes to specifically focus on creating art frames with exotic wood species. He’s also a big fan of modern tech like Apple and regularly serves as the de facto tech support for both sides of the family.